Equip your Samsung Galaxy S8 with rugged protection and superb functionality with the XTrex case in red and black from Olixar. Featuring a handy kickstand for viewing media in both portrait and landscape and an ingenious secure credit card compartment. Fits like a glove, good quality materials, not tested in a drop. Never understood the use for the small slider in the bottom. Recommended! Good , sturdy cover . Worth the money! 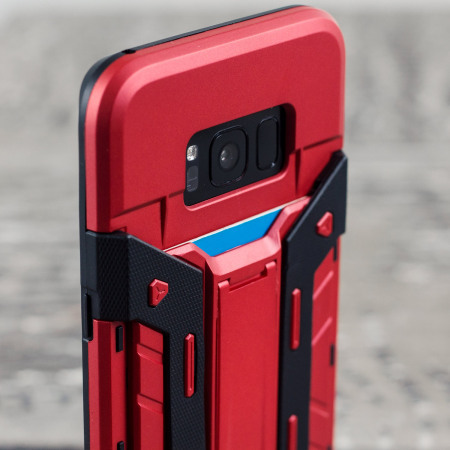 I was a little disappointed at first when it did not have a screen cover but actually due to the design the case is raised just above the screen giving it some protection ...so that would be my only negative .. 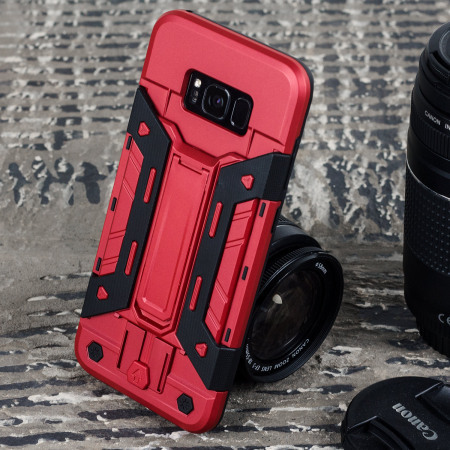 Featuring a robust multi-layered design, the Olixar XTrex provides excellent protection for your Galaxy S8 and just might be the best all-round travel case available. 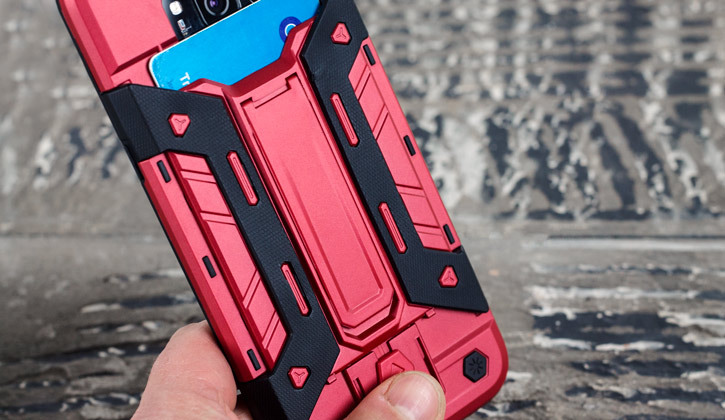 This hard-wearing tough case safe-guards your phone against whatever life can throw at it, keeping it secure at all times - even in the most extreme of conditions. 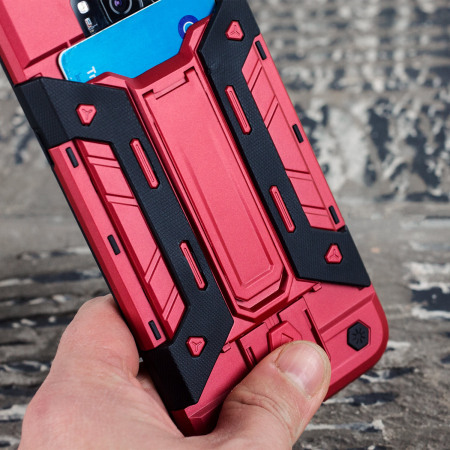 With rubberised non-slip bumper pads, textured surfaces for extra grip, a secure card compartment and a handy flip out kickstand, few other cases come close to the protection and features on offer here. 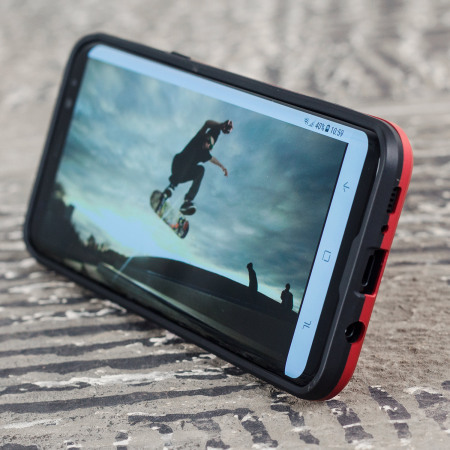 The XTrex is suitable for commuting, outdoor travel and everyday use in equal measure. 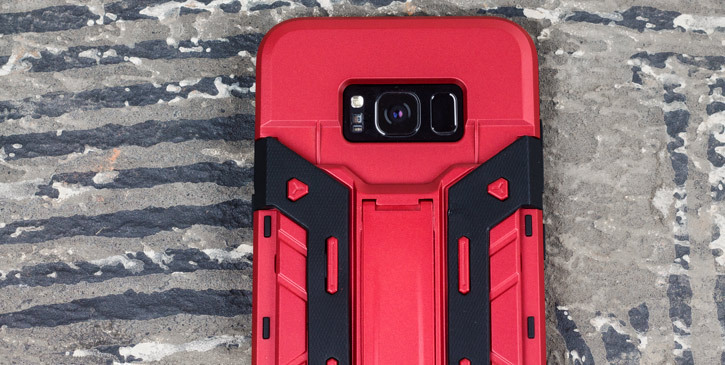 First and foremost, the XTrex is designed to protect the Samsung Galaxy S8 and protect it does, with some aplomb. 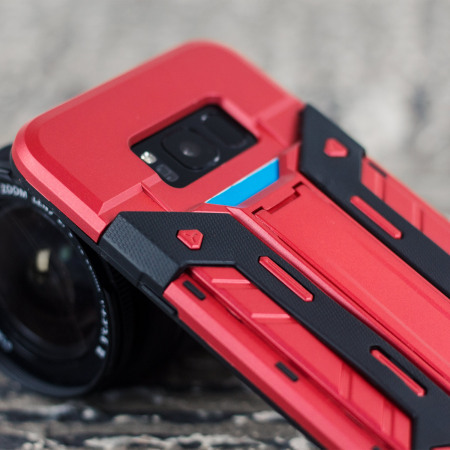 Composite layers of shock-absorbing thermopolyurethane and ultra-resistant reinforced polycarbonate take all the punishment your daily travel and use can throw at your phone, including drop protection. 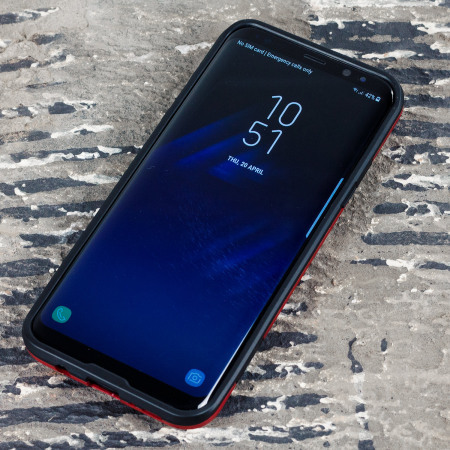 The front facing lip is raised above the level of the screen, meaning it will keep your screen off flat surfaces so it doesn't get scuffed or dirty. 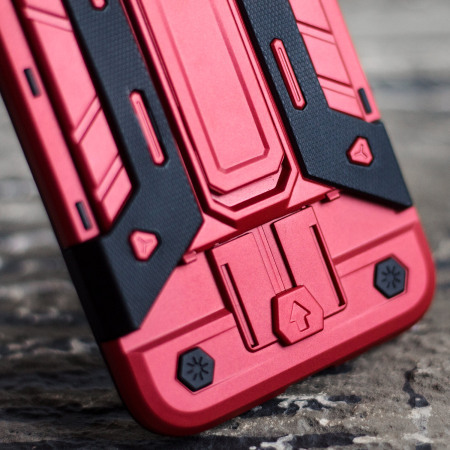 Reinforced corners are designed to deflect shock force away from your phone and the corners are the most vulnerable areas of any phone or case. 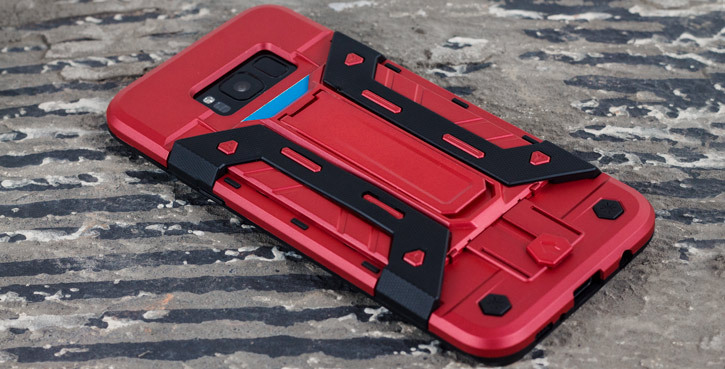 Likewise, the phone's vulnerable buttons are catered for with generous and fully functional covers. 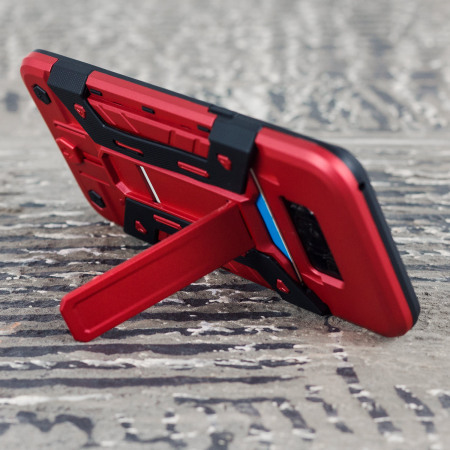 The Olixar XTrex case features an ingenious back compartment that can hold up to 2 credit cards or IDs. This is a secure and ingenious way of storing your most vital cards and also means you can leave your wallet at home if you want to. Please note: Black case used as an example only. 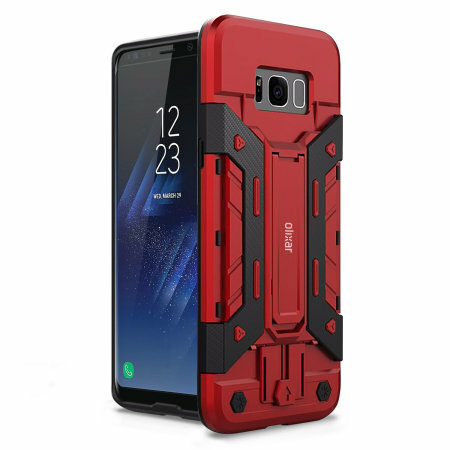 The sleek military styling and slimline construction of the XTrex case combines to create a case that perfectly compliments the Galaxy S8's stunning design. 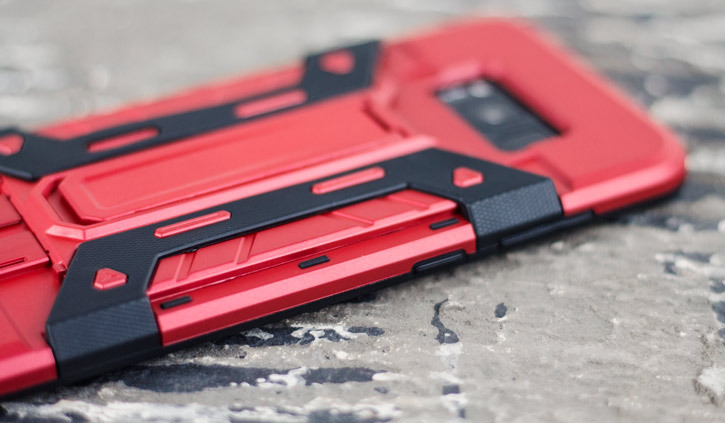 With it's dual material design, tough talking rugged aesthetics and angular detailing and clean lines, the XTrex is very much a case for modern times and all situations. 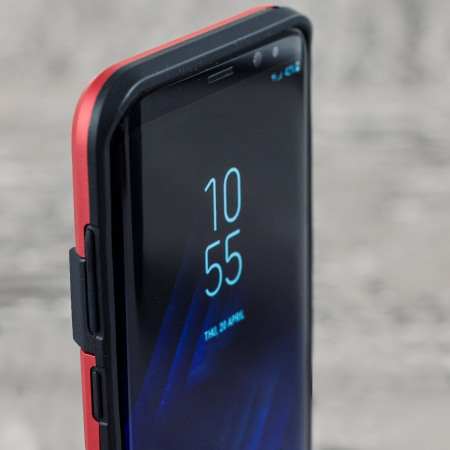 With full access to all of the Galaxy S8's ports and features, the Olixar XTrex Case allows you to use your phone as you would normally, but with the added peace of mind that this highly protective case.